RALEIGH, N.C. - NC State head football coach Dave Doeren has announced that Todd Goebbel has joined the Wolfpack staff as tight ends coach/special teams coordinator. Goebbel, who comes to Raleigh after spending the last five seasons at Marshall, brings experience as a special teams coordinator, offensive coordinator, recruiting coordinator and has also coached a variety of positions on offense during his career. "What drew me to Todd was how impressed I've been with Marshall's special teams when we've played them each of the past two years," said Doeren. "I'm excited to add a guy to our staff who has great knowledge in the kicking game - running all of the units and coaching the specialists- and who also knows how to coach multiple positions on offense. He has developed players at tight end, quarterback and wide receiver during his career. "He is known as a terrific recruiter and I was blown away by his organization, teaching method, passion for the game, and relationship-building skills." "My family and I would like thank Coach Doeren and NC State for giving us the opportunity to join the rich Wolfpack tradition and this special football family," said Goebbel. "I have had great respect for what he has built, both on and off the field, and I am excited to be on this coaching staff that is completely committed to bringing a championship to Raleigh. 1Pack1Goal!" In 2017, quarterback Chase Litton finished his three-year career as one of the most prolific passers in Marshall's history, ranking fourth all-time in completions (727) and touchdowns (72) and fifth in passing yards (8,332). Under Goebbel's eyes, Marshall's special teams were superb, too, leading the nation in ESPN.com's Special Teams efficiency rating in 2015 and finishing 21st (second in Conference USA) in 2018, when Thundering Herd long snapper Matt Beardall was also named a first-team all-league pick. 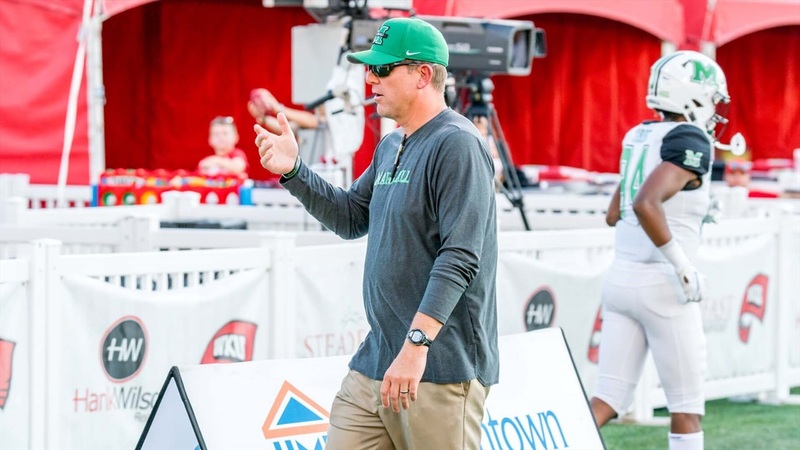 In 2015, as the Herd finished 10-3 and won its fifth straight postseason game in the St. Petersburg Bowl, Goebbel coached sophomore tight end Ryan Yurachek, who finished as Marshall's No. 3 receiver with 44 catches for 417 yards and nine touchdowns. Those nine TDs led the Herd. Kick and punt returner Deandre Reaves was the Conference USA Special Teams Player of the Year and finished his career as MU's all-time leader in kick return yards. Reaves averaged 30.1 yards on kick returns and scored three TDs on returns (two kicks, one punt, tying the school mark). Punter Tyler Williams averaged 44.4 yards per kick and closed his four-year career with the Herd's punt yardage record (43.9), while four-year long snapper Matt Cincotta finished his career with 569 snaps … and no bad ones. Williams and Cincotta were All-C-USA second team selections. Goebbel's offense averaged 35.6 points and 445.3 yards per game, led the country in completion percentage (67.9) and was second nationally in red zone offense (90.9 percent). In 2012, as ODU finished amongst the nation's best in scoring offense, averaging 40.8 points per game to rank 12th in the country. The Panthers ranked 13th nationally in rushing yards (244.9 per game), 27th in total offense( 452.8 yards per game) and eighth in passing efficiency (161.0) while allowing just six sacks all season, the fifth-best mark in the country. Under Goebbel's tutelage, Ohio Dominican enjoyed its most prolific rushing attack in school history. Running back Mike Noffsinger set the school single-season and career rushing records and was honored as a Hill Trophy candidate in 2011. Prior to his first stint at Marshall, Goebbel served as Ohio State's defensive quality control coach for one season (2004), coaching the specialists and assisting with special teams. He holds a bachelor's degree in Physical Education from Northern Iowa and a master's degree in Educational Leadership from Quincy University.